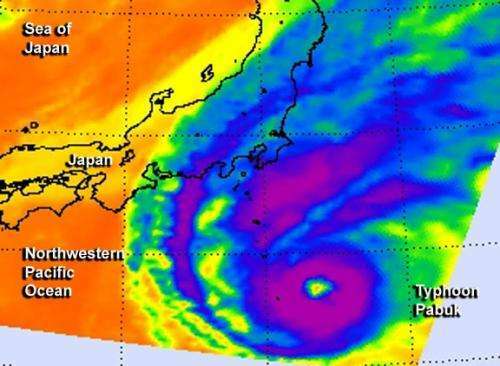 Typhoon Pabuk weakened and the core of the storm was changing from a warm core tropical system to a cold core low pressure system as it continued paralleling the coast of Japan on Sept. 26. NASA's Aqua satellite provided a visible image of the transforming storm that had lost its eye. On Sept. 26, 2013 at 03:55 UTC/Sept. 25 at 11:55 p.m. EDT, the Moderate Resolution Imaging Spectroradiometer or MODIS instrument aboard NASA's Aqua satellite captured a visible image of Tropical Storm Pabuk skirting eastern Japan. MODIS imagery also showed a steady influx of cold air stratocumulus clouds into the low-level center of Pabuk, which was helping transition the storm. On Sept. 26 at 1500 UTC/11 a.m. EDT, Extra-tropical storm Pabuk had maximum sustained winds near 60 knots/69 mph/111 kph. 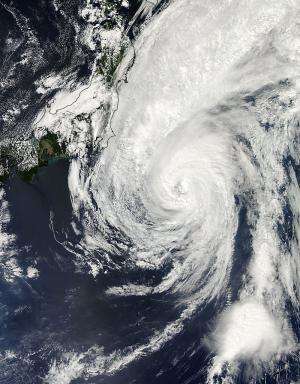 The center of Pabuk was located near 34.9 north and 146.7 east, about 441 nm south-southeast of Misawa, Japan. Pabuk continued to track to the northeast and has sped up to 25 knots/28.7 mph/46.3 kph per hour. Satellite data revealed that Pabuk's low-level center has become elongated and more ragged on Sept. 26. The Joint Typhoon Warning Center noted that the entire tropical cyclone appears more asymmetrical and fragmented. Pabuk is now part of a baroclinic cold air mass and is rapidly transforming into an extra-tropical cyclone. By the end of the day on Sept. 26, Pabuk is expected to be a cold core low pressure system over the open waters of the Northwestern Pacific Ocean, and the Joint Typhoon Warning Center issued its final advisory on Pabuk.